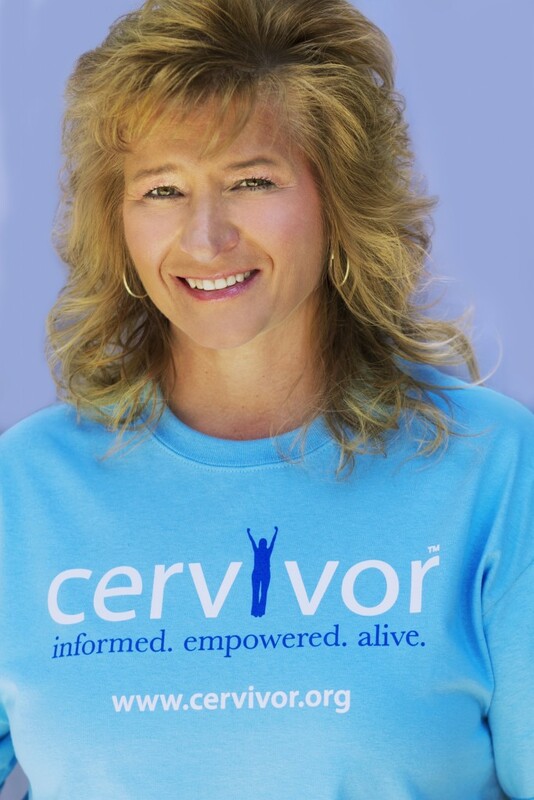 Today on Cervivor, we’re sharing Corine’s story. We hope her experiences can help other women traveling a similar path. 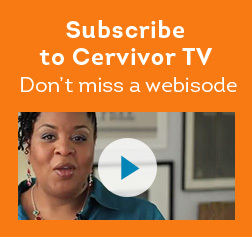 “My personal experience with HPV and cervical cancer is a long and continuous road. It all brought me to where and who I am today, and most importantly, where I am headed. Back in 1999, one of my best friends was experiencing abnormal PAPs for about two years. At that time there was no such thing as standard HPV testing and the connection between high risk HPV and cervical cancer existed, but was not common knowledge. My friend’s doctor was perplexed by her issues; colposcopies and biopsies were not leading to any answers. It wasn’t until the end of 2000 that he was able to access an HPV test kit to see if that gave some insight into the problem. Luckily, it did. The test clearly showed that my friend had concerning high risk HPV. After extensive research, her doctor concluded that this was what had been causing the changes to her cervix for so long, and another colposcopy was scheduled. During that exam, the Doctor saw what he believed to be a cancerous lesion. The biopsy results confirmed it and she was immediately sent for a consult with an OB/GYN. Within one week she was told she had aggressive cervical cancer and would need full hysterectomy at age 40. This was such a sad, chaotic and frightening time for her, her family, and her friends. How did this happen? She had been going to the doctor regularly and getting every test done as requested. How could they not have caught this and addressed it before it got so advanced? I will tell you how: Because she was at the forefront of a huge medical breakthrough! Doctors were just beginning to realize that if they tested for HPV and caught high risk patients earlier and treated them more aggressively, they COULD stop the cancer BEFORE it advanced! Bittersweet. Huge advancements for gynecological patients around the country, but a hard lesson learned through her journey. No, the story doesn’t end here. Not even close. My friend underwent a hysterectomy and was told that no radiation or chemotherapy was needed at that time. She developed complications from a fluid-filled stomach which was thought to be more cancer, but ended up being an infection related to the internal organs shifting around after surgery. There were a few heart stopping reality checks; what they thought was metastasis in her liver, and a false/positive PET scan that suggested even more extensive metastasis, but turned out to be wrong! About 1 ½ years after her initial hysterectomy, a lump appeared under my friend’s arm. Her Doctor first gave antibiotics to address a possible infection, but the lump didn’t change, so she had surgery to biopsy it. Turns out, it’s cervical cancer. Because of the removal of the lymph nodes in her pelvic region during the hysterectomy, the cancer had spread to the lymph nodes under her arm. This was a far spread from original site and also considered Stage IV. Things were getting real. No one had heard of cervical cancer spreading to that area, and at this time, there were no known or documented treatment plans. It was anyone’s guess what would happen next. When I accompanied my friend to one of her oncology appointments, the doctor started by handing her a brochure about where to get a wig when her hair falls out. A bad start to say the least. After listening to the Doctor’s spiel with suggestions of extremely toxic and high dose chemotherapy, I asked what she was basing this on, and she didn’t have an answer. When I inquired as to how many times she had treated cervical cancer that had spread to this region, the Doctor responded that she never had. She told us it was not something documented as ever happening and there was no text book to refer to; so she was just “guessing” at the best treatment plan. Guessing?? If it were your mother, sister, daughter or best friend would you be guessing this same way? No response. Out the door we went! This marked the point when myself and another friend (who happens to be a nurse and legal consultant) jumped into survival more. We researched everything, including information on a study from Switzerland that showed women with metastatic cervical cancer did best by combining Cisplatin chemotherapy and radiation at the same time for approximately 6 – 8 weeks. We were able to get more information by communicating via email with many helpful medical researchers. With all this information in tow, we helped direct my friend to the right physician at Memorial Sloan Kettering Cancer Center. The Doctor was intrigued by her case, listening to all the suggestions and history up until this appointment. He had also heard of the study being conducted in Switzerland and agreed with that approach, suggesting it to my friend. He also said that if she had agreed to the other doctor’s suggestion, the chemotherapy would have definitely killed her before the cancer ever would! The treatment plan was coordinated with local doctors closer to her home in New Jersey, and my friend fought through it like a champion. She has just celebrated 12 years cancer free! Right around the time that she was finishing treatment, I received a call from my OB/GYN about an abnormal PAP and was told to come back in for a colonoscopy. Now my fun begins! I had high risk HPV and abnormal biopsy as well. 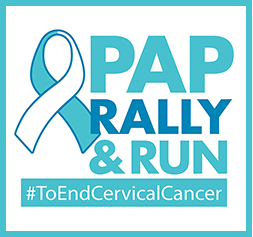 My Doctor wanted to put me right in the hospital and do a cone biopsy, but thankfully I knew more about PAPs, HPV, and the connection to cervical cancer than ever before, so I understood how important second, third, and fourth opinions were. I was NOT going to go blindly or quietly through this experience. I got myself into a clinical trial that was being conducted at Memorial Sloan Kettering for women with abnormal PAPs and high risk HPV. Dr. Carol Browne was phenomenal! She treated me initially with a colposcopy, then monitoring, then when things changed, a LEEP. As we were approaching the 2 year and no recurrence mark, I went in for an exam and began to bleed. She went into emergency mode and we did a colposcopy right then and there. Changes were occurring again in my cervix so she then suggested a D&C and additional biopsies. Thankfully, after that I went a year with no further issues and was able to follow up with a local doctor. All was good until about 3 years ago when I had another flare up of high risk HPV. Cue the immediate colposcopy! All was negative and has been fine since then. I am thankful every day that I was able to learn what I did through my friend’s journey which assisted me in helping myself the best way possible. That’s when I decided that if my friend’s experience could be so helpful to me and spare me encounters with bad doctors and bad decisions, I could help others too. Myself and my nurse friend sat down and co-wrote a book to help educate people about their rights as patients.  It explains the importance of getting second opinions, obtaining copies of your test results and medical records, and working to understand it yourself. We dedicated a chapter just to PAP smears and what the classifications mean, as well as HPV and its correlation to cervical cancer. We explained as much as we could so women could get copies of their PAP and HPV tests and understand for themselves what it all meant. The book was a success. Through book signings and interviews for newspapers, magazines, and radio shows, we spoke to people who were grateful for the information. We met people whose eyes were opened to what they didn’t recognize before. We realized there was a need for this information and continued our mission. We began speaking engagements throughout the state and accepted an offer to host our own TV show on a local cable network. We’ve had the show for about 3 years now and discuss important health topics, also hosting guests who share tips and information to help people become more knowledgeable in medical situations. I began volunteering for numerous charities including cancer groups, hospice facilities, and advocacy groups. I continue my work as a patient advocate on many platforms and I believe it is what I need to do. We are much stronger together than we are apart. 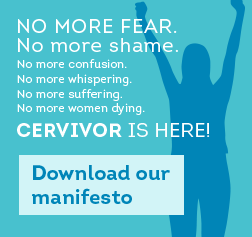 That’s why our main goal here at Cervivor.org is to bring together cervical cancer survivors and advocates from all over the globe. Through research, story-telling, and community advocacy, we can help eradicate cervical cancer and change the future of women’s health. The best way we do this? Our live events, which happen only a few times per year. 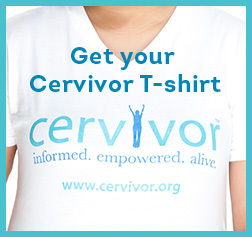 In September 2015, we gather in San Diego, California for Cervivor School, a live 4-day event with expert speakers on the topics of scientific research, media, health-care, therapy, and more. 1. Learning about the different types of HPV and how it becomes cervical cancer. Understanding the basics around HPV and cervical cancer is essential to healing, treatment, and recovery. This is the perfect space to ask questions, share your experiences, and hear from others in a safe, supportive environment. Learn the truth about HPV and the HPV vaccine. Find out what you need to know to protect your family and your health. Become an advocate for the community by combatting false perceptions. Cancer doesn’t just go away, and learning to live with the after-effects of cancer can be challenging. 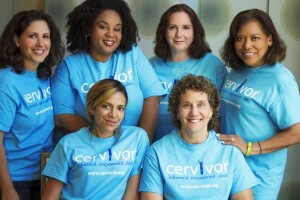 Not to mention the stigma of cervical cancer. Discover how you can thrive within this new normal. Surviving cancer is a pretty big deal. Find out how to share your story in an authentic, empowering way so other people can benefit from what you’ve been through. Don’t let these lessons end with you! 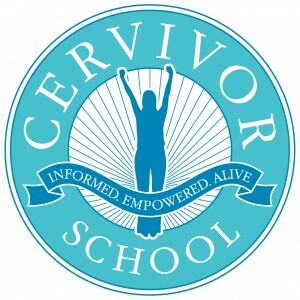 Community and relationship-building is a natural side effect of Cervivor School. Once you begin sharing your story in a powerful and compelling way, you’ll realize just how many people connect with what you’ve been through. You won’t find sisterhood like this anywhere else. Craving this transformational experience for yourself? 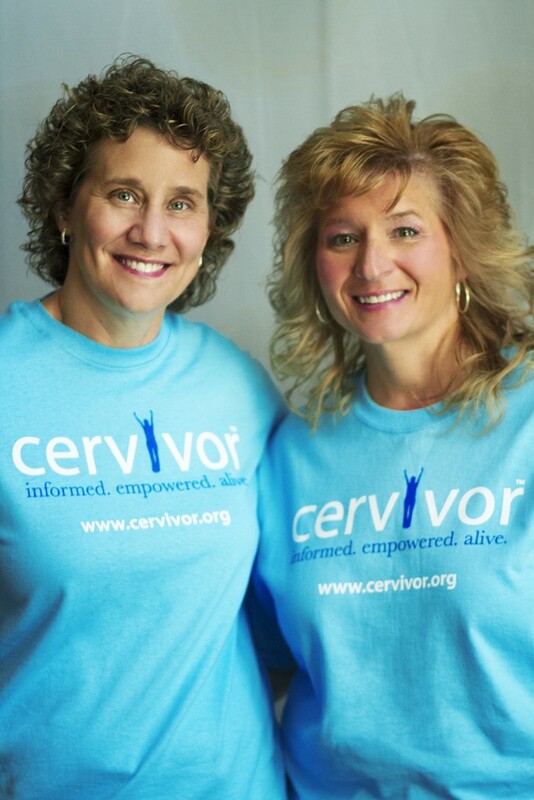 Join us for Cervivor School West, September 24 to September 27, 2015 in San Diego, California. No matter what you’ve been through or where you’re heading, Cervivor School will help you navigate next steps with ease, confidence, and clarity. 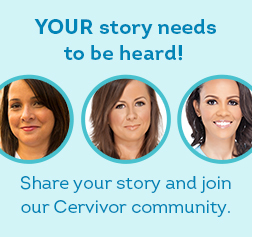 This is your opportunity to learn, grow, heal, and connect with other people in the cervical cancer community. We are here for you, stronger together than we are apart. 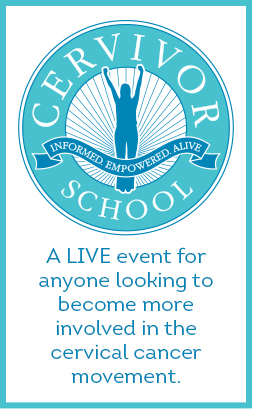 Register here for Cervivor School West.